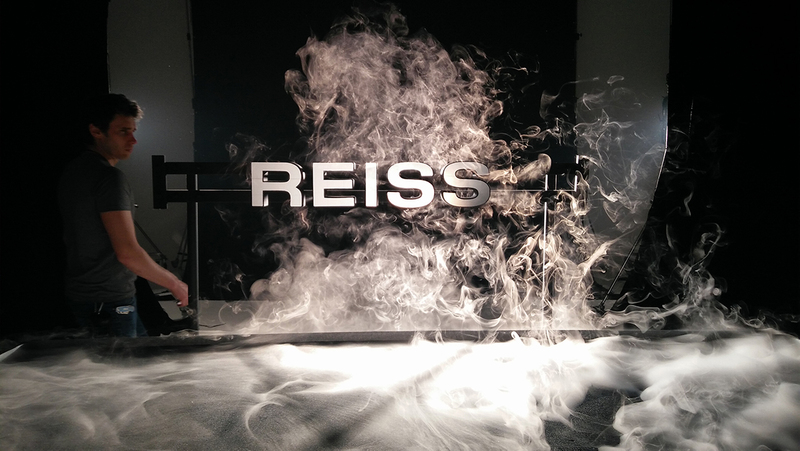 As you can read in our case study, Reiss make lighting for extreme environments in over 90 countries. This special application lighting needs to withstand the forces of nature and industry including high and low temperatures and all the force and impact of the elements. So what we did was work with a model maker to create an illuminated 3D model of the new logo, with beautiful bevelled edges, that could be lit up on the shoot. Once we had an idea of its dimensions and construction, we had to work out how to subject it to the various extreme effects we wanted, in a way that we could capture in camera. An extra level of complication was the decision to capture stills and moving image on the same shoot. A team effort was required – our photographer, Michael Harvey, was invaluable in bringing on board the specialists we needed like high-speed film expert Jason and model maker Tim. Over the two-day shoot, we had our special effects crew pumping the studio with dry ice, setting up a flamethrower, making mini-bombs with electrical detonators, chucking buckets of water and piling ‘rocks’ on rigs, with lots of re-setting between each shot. After all the months of planning, there was still a huge amount of chance in the final takes – there’s only so much you can control when throwing water at a logo. Eventually, we got the pefect take! Our dedicated team of project managers, model makers and film technicians worked together for months. It was a dramatic shoot and great precision was required: explosions being shot at 2000 frames per second when slowed down provide drama and emphasise the strength and beauty in inherent in such a ‘fit for purpose’ product. 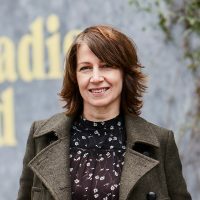 The result is a film and series of images that depict the total commitment to quality, service, outstanding performance and reliability provided by Reiss. By boldly bombarding the logo with these elemental forces, we have created a thing of great beauty. The judges at Brand Impact seem to agree. The Reiss brand has been shortlisted in the Technology & Telecoms sector. We look forward to the announcement of the winners on 13th September!